Cafes and restaurants in New York are so beautiful that they sometimes look like cinema sets… Oh and the chicken salad at Cafe Colette is to die for ! Ok, now I’ve got to go : New York Fashion week is starting, the days start super early and end soooo late ! By the way, I have a question for you : are you looking forward to fashion week(s) or are you weary of it ? What kind of coverage would you like to see ? How many fashion weeks? Up to 3 is ok. But when you jump from Milan, to NYC and then Tokyo could be hard. C’est vrai, les cafés sont beaux et agréables. Les fashion weeks, on dirait qu’elles ne s’arrêtent jamais sur les blogs, c’est un peu trop en effet, mais on a droit à de belles photos. C’est vrai ça, quand n’y-a-t-il pas de fashion week dans le monde ??? I am waiting! Great photo Garance. I love coffe too…i am an addict i think! Jolie photo et bel endroit. Nous, ça ne nous exaspère pas, du moment que c’est bien traité ! On aimerait voir des choses que toi seule peut nous montrer. La Fashion Week new-yorkaise par Garance, des indiscrétions, des coulisses, des instants volés ! Allez Garance, on compte sur toi ! j’aime beaucoup le look des mannequins avant ou après les défilés ! Ouais ! C’est trop vrai on se croirait dans ces films des années 40 ! Tu nous fais rêver Garance ! I love fashion weeks but this time with the cold I am a little bit sceptical as Milan is freezing….! Diary of a fashion stylist! I think the same that Pose Mag. Let’s sow us your special captures, because it is more inetersting than the “official” shoots. Well maybe is because I prefer the stylelife instead of fashion. Have a nice weekend! P.S. Now I REALLY want to visit NY and spend all my days in Cafés! de l’insolite, des surprises, des couleurs et en sortir avec une faim de nouvelles sapes!!! I’d like to see real people wearing affordable but stylish outfits not just designer ones. Oh this photo looks like a movie set indeed! That girl is so beautiful, and what a style! Personally, I love the style of your fashion week reports, both from the runway and the street-style. I miss a bit your videos… Probably a video per show like you did two years ago is a bit too much, but I’d love another video or two like “a month in fashion”. Overall, I think that what makes your Fashion Week articles so beautiful is that you put your personality and taste in them. I also love the ones in which you write something and tell a story… I mean, for the mere runway photos I can go to Vogue or Style.com, but your fashion week posts (also the photo reports, you have an amazing photo style, different from any other website) have an added value so please keep them coming! Oh and why don’t you do some backstage? I’d love to see your take on that! Have a great Fashion Month! Ca m’exa-cite! et j’aimerais voir du neuf et pleiiins d’accessoires! Les fashion weeks étaient pour moi des vrais fantasmes de gamine. Un rêve, un but parfois (un peu zinzin parfois). J’aime toujours cet ébullition à ces moment là. J’aime être à Paris en période de fashion week et voir la ville se transformer, certaines station de métro regroupent des grappes de mannequin. Au fond je crois que j’aimerai faire parti de tout ça a un moment dans ma vie. Vivre au cœur de ces événements. Même si aujourd’hui ce n’est plus le grââl de ma vie j’aime toujours en entendre parler. Le voir en attendant de la vivre. Oh j’adore tes articles sur les fashions weeks; les photos des défilés, des stars en front row. Mais ce que j’aime surtout, ce sont tes impressions personnelles; tes textes sont tellement drôles ! Ca donne un point de vue un peu différent de ce qu’on peut voir d’habitude. I’ve never been in NYC! stop talking about it! hahahaha everyone is in NY this week :( and I’m in Barcelona!!!! J’ai lu dans ELLE une interview de Jean-Jacques Picart, qui prédit la fin des fashion weeks… je serais curieuse d’avoir ton opinion sur le sujet? Merci pour tout tes posts qui font voyager. Ce lieu se rajoute à ceux que je vais squatter la semaine prochaine lors de mon séjour à New York comme beaucoup d’autres que j’ai trouvé sur ton blog, Merci ! Te lire chaque matin est toujours un tel plaisir. … Quant à ta question, participer à une Fashion Week serait trop le rêve pour moi qui souhaite travailler dans un bureau de tendance c’est vraiment THE event qui me rend dingue !! I should not have looked at your site before breakfast because now all that I want are those scones or rolls or whatever delicious things they are with white icing…..
J’ai lu dans ELLE que Jean-Jacques Picart prédisait la fin des fashion weeks… qu’en penses-tu? J’attends avec impatience tes posts à ce sujet! I think I like ‘streetstyle’ and portraits best (during fashion week). i side with red dot-al, except for the backstage thing, which doesn’t interest me that much. but just do as you see fit, and it will probably be fun for us all. and thanks for asking! Can’t wait for your fashion week posts, you have the best eye ever. More backstage photos would be interesting. Also maybe close-ups of detailed fabrics and unusual detail on handbags and shoes. Je voudrais en voir ce qu’on peut pas voir dans les magazines de mode, les gens avec du style, pas nécessairement habillés dans les pièces les plus chères qu’on peut trouver sur le marché. I am attending London Fashion Week. I am following you on Bloglovin for a while. I agree- I love to see lots of streetstyle shots over fashion weeks. This girl is beautiful! Looks like a great cafe! i wish i were in nyc! J’ai hâte d’en voir plus sur la fashion Week : des photos de styles et encore du style, j’adore ! Too many fashion weeks?! No – I love them – it’s interesting and stimulating and inspiring to see the professional and street fashion. I only wish I could attend. Celebrating beauty is a good thing. I’m not going to fashion week but i’m sure looking forward to seeing what comes out of it. Oh, & living vicariously through you who will be attending (although i’m sure you work very hard). Looking forward to the posts that follow. I like when you show us your videos “from the front row”. Plus a street style photos. Maybe interview some editors as to what a “typical” day for fashion week consist of?? More than the fashion down the runway, I’m am fascinated by the people that attend the shows and what they wear. I think fashion is more attainable from what real people wear than models and dresses that have been fitted time after time to their bodies. Don’t get me wrong, I find the whole thing fantastic. But what I gather from the shows is just the inspiration for color palettes and overall style. When I was little, I used to love Fashion Television, and to hear what the the fashion experts thought about the show they’d just seen! More than understanding the show itself, it gives you an idèa of how someone else can see things in a different way than you do yourself. It is very inspiring! I would love to know if anyone knows of a website or tv program that is more interesting when it comes to the fashion weeks-and shows, instead of just showing the catwalk photos. I look forward to your FW posts, Garance! I will love you to write about your unique and particular point of view of this new New York Fashion Week…You know…People, Partys, funny yet ridiculous situations…Know what I mean?…’CAUSE YOU ARE GARANCE THE FASHION PHILOSOPHER! Another address to visit in my note book! Merci! I am looking forward to seeing your pictures of the FW. It is not about what we expect but how you see the people on those scene with you wonderful eye. You always spot wonderful styles, crazy mix of accessories, out of the time hair cut… Give us our treat! Ce que j’aimerai en voir c’est les petites mains qui s’affairent derrière. Entendre ce que pense ceux qu’on ne voit jamais. Les retouches de dernière minutes… tout ça ! Que tu as raison point de vue décors des restaurants et cafés à New York. L’été dernier j’ai passé deux mois dans cette merveilleuse ville et je n’arrêtais pas de passer mes journées dans ces lieux. Tellement inspirant! Et surtout, tu trouves de tout! Chaque époque, chaque style, c’est incroyable. Mon blog magazine est live depuis hier, allez-y!!!! Didn’t you come here in Spain to Madrid FW? Ok, I would like to see YOU and models before and after the shows. As an average blog-reader I have to say that I’m not really looking forward to the fashion weeks as much as the bloggers themselves do. Because then they all post pretty much the same. The same pictures from the same shows, the same partys and so on. When the bloggers are in their own environment they take their own pictures, write about their own thoughts or topics and look like themselves. And that’s much more interesting to me. I love this woman’s outfit. It’s a great, slightly quirky look. I’m looking forward to seeing tins of streetstyle photos from fashion week, hopefully more non celebrities than all the usual suspects. This photo is lovely. Love the head wrap! Ce qui nous a frappé nous, c’est qu’à New York, les filles sont vraiment belles, issues de mélanges divers avec une touche de modernité indescriptibles. Les gens à New York ne sont comme personne ailleurs. Des yeux clairs sur des peaux typés, des androgynes, des belles plantes…. Il y a de tout et je ne vous parle même pas des looks, des styles hétéroclytes, travaillés, négligés, exagérés…mais toujours très réussis avec de la recherche. Garance explique nous comment ça se passe les Fashion weeks. Il y a t-il une règle en terme de calendrier? New York en premier? Londres, Paris, Milan, ensuite?…J’avoue que je n’arrive pas à suivre et que je ne suis qu’une nouvelle initiée. Have fun en tout cas & post nous de jolies photos, inspirantes & étonnantes. I’ll be in paris in a couple weeks for fashion week. Can’t wait to maybe spot you in the crowds!! Comme je n’ai jamais assisté à une Fashion Week de ma vie je ne peux pas dire que le fait d’en entendre parler m’ennuie car cela m’intrigue. Après les milles et une revue sur les blogs sans personnalité je n’aime pas trop, mais quand c’est raconté de façon intéressante, drôle, que ça me fait voyager et surtout que ça m’enrichit moi ça me va ! J’aime l’équilibre entre Street Style et Fashion Week, selon moi, désormais l’un a besoin de l’autre, même si la mode existait avant le Street Style je crois qu’aujourd’hui c’est un facteur indéniable, il n’y a pas que les mannequins sur les passerelles qu’on prend en photo, on les prend hors de ce contexte, ceux qui assistent aux défilés aussi sont pris en photo, c’est aussi grâce à ceux qui ne défilent pas que la mode se fait. Pour moi c’est comme si il y avait une Fashion Week des podiums et une autre à son entrée. Sinon les FW… Ca doit être super pour les professionnels de la mode, créatif etc. Vu de l’extérieur : c’est tellement exclusif qu’on a très envie à la fois de voir ce qui s’y passe tout en se sentant injustement exclus, donc effet repoussoir. Je ne comprends pas non plus pourquoi il y en a tant. Enfin, ça sent l’égo à plein nez (il faut y être vu surtout aux fêtes ou il faut être vu, il faut qu’on les regarde sous une cloche de verre infranchissable et très transparente à la fois). Il semble que les icones fashion soient de plus en plus nombreuses, starifiées, et… de plus en plus maigres/faisant la gueule ==> donc hors réalité. Alors au final je ne sait pas trop quoi en penser. Have a wonderful time at fashion week! Looking forward to your update! Thank you for asking! Stylish women wearing their own clothes as opposed to borrowed from fashion companies. Jolie photo ! ça m’a l’air d’être un bel endroit ..
Moi ce que j’aime voir des fashion week se sont les gens présents pour l’occasion! aahh new york is so incredible, even coffee turns into a special experience. I just want to see the pictures you take! I love your behind the scenes shots, it shows such a quirky, interesting side to fashion, and they are so refreshing after all the industry shots. Thanks in advance!! Enjoyy the show ! I agree with Judith, in that your own world is more interesting and beautiful than FW, although that sounds like heresy. I suppose it is because you understand how to evoke your “own world” among others, that we love to read about it. It’s a bit dismaying to see the editors and guests looking exactly like the runways, so please keep finding the special moments and video impressions that transport us so swiftly from our chairs/couches/desks to that other place. any idea where these glasses are from?!! i desperately want to try this spot. usually don’t make it over to brooklyn but just might for this haunt! Je lis ton blog depuis quelques années et voilà que je me décide à laisser un commentaire. J’adore les petits coins de New York que tu nous dévoiles mais j’aimerais en savoir plus ! Fais une interview de toi ! J’aimerais des petites adresses shopping, des coins où prendre un verre en amoureux, un quartier où se promener bref ton petit best of New York à toi. Merci pour tes images, tes illustrations, tes textes qui me font sourire au quotidien ! Ce que je voudrais voir de la fashion week ? Non pas des mannequins porte-manteaux mais des mannequins humains. Oui, c’est vrai, ils les vivent comme eux ces fashion week ? J’adorerai assister à une fashion week, l’ambiance, la mise en scène parfois improbable sur les défilés… Mais un monde fou ! Someone above said photos of fashionable style, hair and makeup people, and who ever else is inspired and working in the back ground. I vote for that. And I would love to see some shots of you. I love your style and wonder about what someone like you would wear while covering such an fashion insane event. I love fashion “month” and getting absorbed in all the new collections. However, I feel the current coverage (not yours per-say) is too saturated with street style photos featuring the same people. I’d love to see some photos/interviews/videos with the designers and learn about how their collection was conceived and what is really inspiring them. And more of an in-depth look at the new collections. Your point of view, your artist’s eye (and Scott’s) are always a refreshing change from the usual…I am bored to death of ADR and company and find their style absurd. If I were you I would look for trends emerging from real street style and also from the fashion people who are not always in front of the camera! I am remembering a photo Scott took a few years ago at Pitti Uomo of an Armenian woman wearing a beautiful tweed coat. I went out immediately and combed the thrift shops to find a similar coat. Today I wore that coat and three people said, “I love your coat”. The unsung heroes of the fashion world, the people who dress like ordinary people–just a little better- are much more interesting than the editors in their get-ups. The real style is a little more quiet! Ah non, fashion week ça fais tout sauf m’exaspérer! Septembre et février sont mes périodes préférés de l’année…. Il y a une ambiance tellement chargé de créativité, d’excitation…. The lighting in this photo is beautiful, as is the model. Her glasses are fresh. The palm-tree detailed wall hanging is vintage, non? Could you post a story about what happens to all of the clothes that were modeled after fashion week is over? Maybe the story would be ‘the business side of fashion week’? I don’t think I will be tired.. would love to see what people are wearing.. ! Nice wallpaper in this cafe. I’m loving all sorts of Blue at the moment, perhaps because of the Elle Deco of this month featuring these lovely colors. Something refreshing to see during Fashion Week is small designers, upcoming designers, these people who don’t have the money but the passion and still make great fashion. Would like to see the accessories and would love to see fashionably 40-something girls are wearing! Très belle photo ! !! I really could care less about fashion week….. I like to see the people on the street and how they wear it…. Moi ça me déprime, parce que je suis étudiante en droit et que j’ai pas de vie ! I so appreciate your personal take; what captures your imagination & then how you capture the images and give them to us as if from your seat at the shows. It gives us an opportunity to feel as if we are there, especially the videos. La seule chose que j’aime dans les fashion weeks (genre je les suis toutes… haha) ce sont tes posts (et surtout tes vidéoooooos)! Gorgeous atmosphere. I absolutely adore wandering around coffee shops’; I think London as well has the most amazing little cafes as well. My personal favourites are the boudoir type, you know, sugar and spice and everything nice. There is a little shop in my neighbourhood that is boutique shop who has the tiniest (and cutest) mini tiny boutique cafe and the smallest cutest patio. I go there on a weekly basis clothes/accessory spotting..and always end up cupcake eating (aren’t cupcakes the stylish-est food ever?). Which delays the clothes trying…cupcakes & clothes fitting are not such a great…fit? More interested in what people are wearing on the street- that is more relatable to my life than what is shown on the runway. So more street, and perhaps a little blurb about what the person does and what they are wearing. That is real life! Garance, est-ce que par le plus grand des hasard, tu saurais qui fait ses lunettes??? Burberry et Chloë en font dans le même esprit mai celles ci sont top top top ! Je suis une lycéenne (de province je précise) donc un peu éloignée de la folie parisienne et encore plus new yorkaise. Mais pendant la fashion je sais pas c’est quand même un peu la folie par chez moi mais à moindre échelle. Si quelqu’un a un peu un look délirant / bizarre / inhabituel, qu’en temps normal je me serais empressée de critiquer, en période de Fashion Week je dis “Nan les mecs c’est normal c’est la fashion week”. Et aujourd’hui pour célébrer l’ouverture de cette merveilleuse parenthèse : 1) J’ai hurlé sur tous les toits que la fashion week débutait 2) j’ai pris des potes en photos dans des looks improbables. Bref la fashion week c’est la joie, oui c’est une parenthèse enchantée. Et toujours autant d’impatiente de découvrir toutes les collections !!!!!! Bref c’était la première fois que je laisse un commentaire depuis ces quasi trois années que je te suis. Merci de nous faire voyager avec tes histoires toujours rocambolesques et pétillantes et tes comptes rendus de Fashion Week comme personne sur la blogo ne les fait. PS : Referas tu des vidéos de la fashion week comme celles que tu faisais avant ? Les défiles mais aussi le backstage (parce que ça fait aussi rêver) à l’image de ton merveilleux “A month in fashion” ? C’est bien que tu poses cette question, Garance. J’aimerais beaucoup voir le déroulement des opérations de la fashion-week en marge des défilés. C’est-à-dire : que font et où sont les fashionistas lors qu’elles ne sont pas assises au front row ou ne sont pas en pleine séance de pose devant l’objectif de Tommy Ton ? Quelque chose de plus intime, en fait. De plus authentique aussi. Je n’ai pas dit qu’il fallait t’inviter dans leur chambre à coucher non plus (quoique je me demande si Anna Dello Russo porte des nuisettes ou des pyjamas et si elle dort dans des draps pailletés et sur des oreillers à plumes). Mais des photos moins convenues que celles dont sont bombardées les éditrices de mode à leur arrivée aux défilés serait rafraîchissant. Par exemple : Carine Roitfeld dans l’un de ses restaurants new yorkais préférés, etc. Certes, ça finit par flirter avec le voyeurisme, mais d’un autre côté, ces femmes ont choisi de donner à voir d’elles-mêmes. A toi de te proposer de trouver le ton juste. je connais NY, un peu! Et oui, il y a de superbes cafés et restaurants. Connais-tu le Antique Garage Restaurant? Mais j’arrive de Paris et j’avoue que je suis étonnée que tu sois si émerveillée en tant que parisienne. C’est bien tant mieux que tu ne sois pas chauvine mais il me semble que la ville lumière pullule de superbes cafés et restaurants. Certains plus cools, plus sympas et moins chics. Moi j’adore, entre autres, le Pure Café dans le 11e. Pour ce qui est des FW, je ne suis pas dans le milieu alors comme bcp de gens, je ne connais pas trop. Mais ça m’intrigue. Je vais depuis qques années à la Semaine de Mode de Montréal (MFW) et oui je suis très enthousiaste. C’est une semaine de mode émergente qui a encore du chemin à faire avant d’être un événement international incontournable mais je crois qu’elle se démarque convenablement car Mtl est le 3e centre fashion en A du No après NY et LA sur le plan de la création et de la production. Donc je veux supporter touts ces créateurs qui ont tant de talent et je suis cliente de certains d’où les invits. Dans notre ville créative et où souvent les moyens sont limités, je suis toujours heureuse quand des choses se développent et prennent du gallon. De plus, il y a une super ambiance, les gens en profitent pour faire la fête et les montréalais présents en profitent pour s’habiller avec plus de soins que ce soit version cool ou version chic. Notre ville n’est pas Jet Set comme NY ou Paris alors ça fait du bien un peu de glamour car en plus ici les gens ont du chien et de l’imagination. C’est un peu maladroit très souvent mais on se démarque certainement par rapport au Midwest, et à la plupart des endroits en A du N outre NY, LA ou SF. Donc oui, moi je trippe! Il ya aussi l’aspect mise en scène des défilés et venant du théâtre, ça m’intéresse. Mon rêve; assister à un défilé Vuitton ou Marc Jacob, Chanel, Sonia Rykiel et oui, on peut fantasmer; Christian Lacroix. Merci toujours et j’espère toujours un billet sur l’art de porter les foulards. Brooklyn cafes are the best thing next to Paris…. Oh the café. Always a hotspot. I´m a little bit weary of fashion weeks, but a post with some highlights won´t hurt! What I love most about fashion weeks is how everyone dresses up for it, so looots of streetstyle pictures would be great! Looking forward to it. Je serai sur le show Moncler dimanche (au make up) (passes nous voir), je pense que ça va être assez AMAZING ;-). Je me réjouie de tes futures photos en tous cas… Bonne fashion week ! c’est trop cool les fashions week! Every time I read about fashion week, I think, “Wait, didn’t we just do that?” Seems like less of a week than a year-round affair. I’d love to see how people outside the fashion and design world manage to work their personalities into their styles. Is it possible to play with fashion in a regular (decidedly non-fashion) 9-5 job? P.S. – Love that wall in the background of the cafe. Is that wallpaper? Des fashion week, J’aime tout!!! Mais particulièrement tes streetstyles, portraits et tes vidéos tellement sympa mais devenus trop rare. Ta vie semble fantastique, surtout ta facon de la raconter! J’ajouterais qu’il serait en effet tres intéressant d’avoir un post sur l’art de porter les foulards! I am stylish in my mind only, and on the west coast, so the event seems far away . . . though I live vicariously through you! With that in mind, I’d like to see what the “regular” people are wearing at fashion week . . . the non-model like people. Are there any people like that around fashion week? People who are beautifully fashionable and stylish, yet with average body-types (NOT NYC average body type!)? After Lagerfeld’s comments about Adele this week, I’ve been reminded that I’ve backed away from fashion because I don’t feel thin enough. Please, could you show me something that gives me hope in this area? I know this isn’t really your issue, but I love and admire the work you do, and the joy that you bring to true fashion . . . and you asked! J’aimerais voir 1 fashion week une fois dans ma vie! Je suis curieuse! et de faire partie du saint graall… et de suivre la FW à travers le monde NY, Milan et Paris……. I have a dream !! Looking forward to the fashion weeks and to your coverage, Garance. You always capture the shows in an interesting, entertaining way, in a different light. I hate to see the same photos on all the official sites. I would also like to see backstage photos, more detail photos of the collections and clothes. La chaaaance de faire toutes les Fashion week quand même ! Moi j’aime bien çam’inspire et puis c’est l’occasion de voir pleins de nouvelles photos ! Ce café a l’air magnifique en effet. je n’ai rien à dire à propos des fashion weeks, mais ce matin mon stress atteint des sommets -et voir cette photo, magnifique, sa lumière, cette femme, ce lieu… ça me fait le plus grand bien. Alors merci pour la beauté et le calme émanant de tout ça. Pour répondre à ta question, je n’ai pas encore eu la chance de participer à une fashion week ! Mais si c’était le cas, je pense que je serai toute excitée!!! J’adore le nom de ce café. Il porte le nom de ma mère! I’d love to see what you wear everyday during fashion week! I love your style, it’s so simple and chic. And you are beautiful! overall i’d love to see what what you and the other real people/stylish fashion show attendees are wearing. `not interested in runway shots – can see the full show on vogue or style.com etc..
street style! real people, what they do for a living, what time they get up (!) and how they find balance in their lives! :) Merci! L’endroit à l’air très sympa ! Quant à la fashion week, franchement, je veux TOUT voir !! Hi Garance, Of course there is the obvious like photos of people whose style you find unique and latest trends borrowed from designers are not unique. What I love are your stories of what happens during the week, how you get in shape for the week, what are your clothes staples, what are the shoes that you wear to run around, what do editors eat, who are your favourite people to chat to, who are makes you star struck etc. Oh and as one of the readers mentioned a few videos of yourself and Scott running around in all the madness would be awesome!! Have fun!!!!!!!! I am always excited by fashion week to see what is new and different. The main thing I love is seeing the street style of attendees – Editors, fashion writers and especially bloggers! I’m reassured that anything you cover will be beautiful and your writing will be personal and touching as always. what a wonderful photo… the girl in the photo is so beautiful, and the sorroundings, the caffe – tres chic! Its your perspective Garance that makes a difference. I wasn’t interested in style until I came across an article about you Scott in The Guardian website (UK) a couple of years back. Please let us know if you would consider creating a book about your work? It would be a beautiful book. I love your blog and I am sure for most of your fans a book by you would be the icing on the cake. Oh how I love Cafe Colette! My best friend in New York lives on the same block, and they simply make the best coffee in the prettiest setting. Even though I attend the Fashion Weeks myself, I absolutely love seeing it all through your eyes. Unlike so many blogs (which basically spam us with blurry photos of every show and celebrity they spot, with no editorial restraint), yours is beautifully edited and charming. I love how you mix shots of stylish girls (looking happy), favourite shows, funny moments and stories about how Fashion Week is for your. Dommage qu’il n’y ai pas plus de photo de ce café qui à l’air très joli. A propos des fashion week, ce que je préfère c’est tout ce qu’on ne voit pas : l’avant, le pendant dans les coulisses, l’après et tout ce qu’il y autour. J’adore ce bloggg garance ! I have somehow become tired of fashion weeks, and the whole relentless fashion cycle. I never would have believed this would happen. Now I feel that less is more, and would like to say that please leave me alone for a while. Maybe it is to do with the fact that I have found my style. I still enjoy looking at the shows, but do not feel the need for so much newness all the time. So in terms of coverage, maybe like you posted from Rag&Bone; just one look? Minimal, less stress etc. Refreshing. Il a l’air vraiment beau ce café… Simple mais délicat. Et en parlant de café, il y a un film qui est sorti ya pas longtemps Cafe de Flore. Un vrai joyaux du 7eme art. et sinon pour les défilés, tout ce qui ce passe avant, après, derrière dans les coulisses, tout ce qu’on ne voit pas et qui est super intriguant du coup ! il y a une lumière dans chacune de tes photos qui me fait rêver chaque matin où j’ouvre ton blog! Cette jeune femme est magnifique et a un look génial! J’adore ta façon de parler et de nous montrer la fashion week partout où tu y assiste (d’ailleurs, c’est bien simple, ton blog est le seul que je parcours chaque jour car ta vision de la vie, du travail, des femmes et des hommes et de la mode me correspond tout à fait). J’aime le regard que tu portes sur ce monde et cette atmosphère qu’il y a dans la fashion week qu’on terni ou qu’on caricature trop souvent. Tu en as une vision très juste et on sent que tu y vois aussi le coté amusant et ludique au milieu de tout ce show. Continue de nous montrer ce que tu aimes, ce que seule toi remarque avec tes belles photos et ton sens de l’humour extra et, pour ma part, je serai comblée! Yes! I love Cafe Colette! Next to my house. Garance, next time you are in Wbg , you have to try Bakeri on Wyth ave between N8th and N7th!!! so many good things to try there! Mention A+++ pour le burger du Café Colette où j’étais il y a enore quelques jours. Et les cocktails de leur bar d’en face, ah Brooklyn, un roman d’amour. 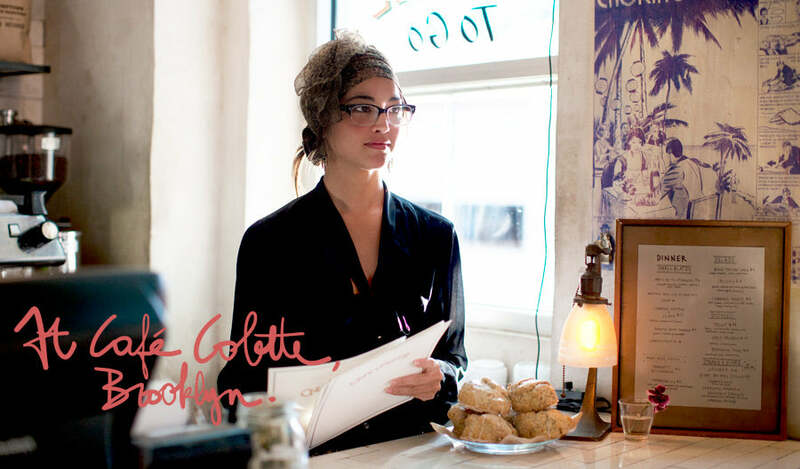 Love cafe colette – it’s our weekly brunch fave! And you’re right – the decor and atmosphere is as good as their food. Garance: I have always enjoyed seeing the street style during the fashion weeks. To me thats where the real fashion is. love the post. i need to check this place out and review it! love your site…it’s beautiful!! Love the photo, it gives me a Hollywood-glam feel… And yes, Fashion Weeks can be exhausting (I know, luxury problem, ow, the awe, but still… ;))! As a fashion journalist I start early, run from show to show, sketch, take photos, write down notes, I interview designers, come home very late, sit down behind my laptop to write till even later…after a couple of days, with little sleep, bad nutrition (Although every time I promise myself to do better, I have the tendency to live on coffee, diet coke and salty pretzels during Fashion Week) and little fresh air, I literally feel jet-lagged. But every time I sit next to the catwalk and the models pass me by in the new collections, I enjoy my moment of fashion-Zen. :). I love the sound of fashion weeks, especially Paris Fashion Week. I’d love cool, original photos from the big shows like Chanel. Dior, and Lanvin. These pictures should be from the details of the front row, to the details on the catwalk and the street stars outside. It’s the street stars composed of celebrities, and editors that actually teach us how to wear clothes in the hottest possible way.